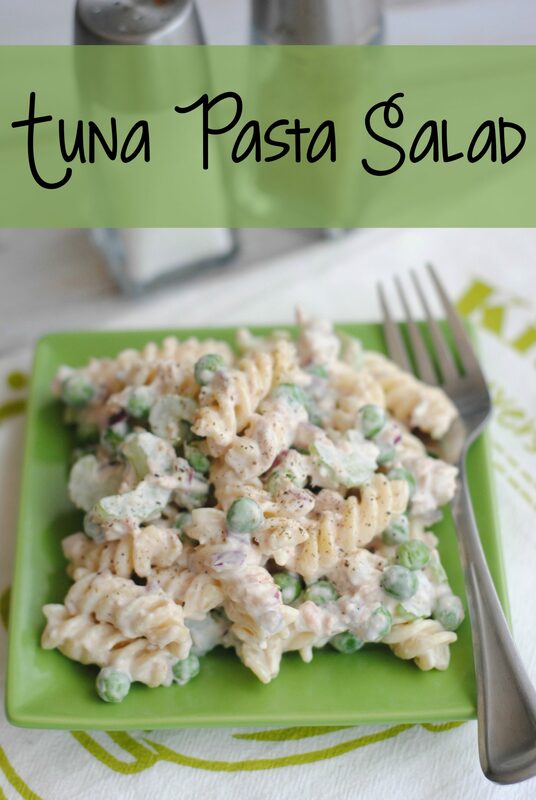 There’s something about pasta salads that make me think of my grandma. Every summer growing up, my family and I would “escape the TX heat” and spend a few weeks at my grandma’s lake cabin deep in the woods of northern MN. Gorgeous country. Beautiful lake. Cozy cabin where my extended family would gather. While we ran around, played in the beach, spent time on the canoe and catching fireflys, my grandma was often in the kitchen. She made elaborate (but oddly simple) meals for us all each night…cooking for upwards of 24 people on any given night. She made this mean pasta salad. IT WAS ALWAYS IN THE FRIDGE. I often wondered when she made it, among all the other meals and dishes she worked on in the kitchen. This was the staple. 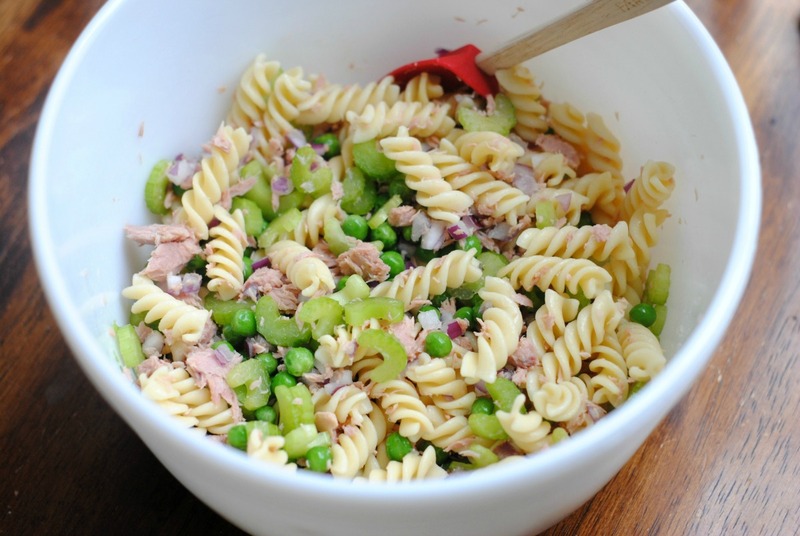 Pasta, tuna, peas and dressing. I’ve added my own “crunchy twist” on it with the celery and red onions. The dressing she used is what make it so amazing. She used “sandwich spread” and tossed it with the pasta and other mix-ins. It’s a bit sweet, a bit tangy and has the same consistency as mayo. I ate bowl after bowl…after bowl…dozens of bowls over the time I spent at her cabin. Brings a smile to my face just remembering this amazing pasta…and her amazing service to our family in feeding us so well. Important: if your store sells “sandwich spread” (it’s near the mayonnaise usually), then use that in place of the mayo and lemon juice. 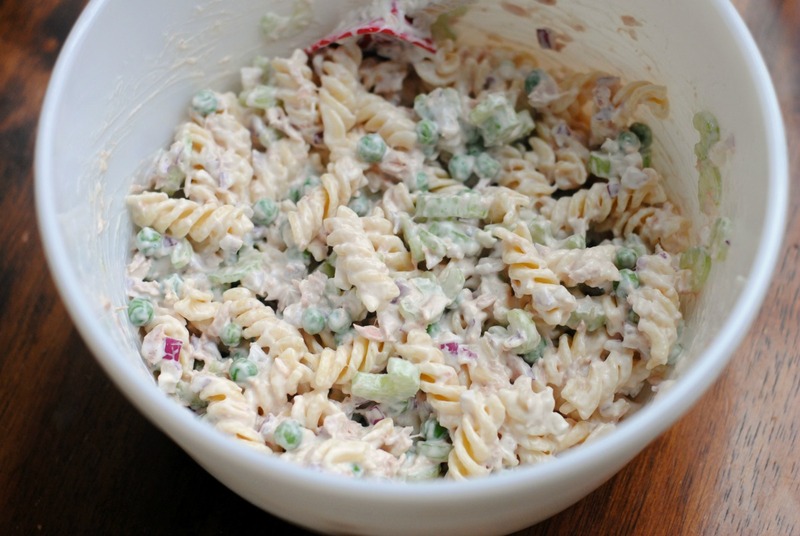 It’s outstanding…and my favorite dressing for pasta salad. I’ve written this as mayo and lemon, in case you can’t find the sandwich spread in your store. Get a giant bowl out. 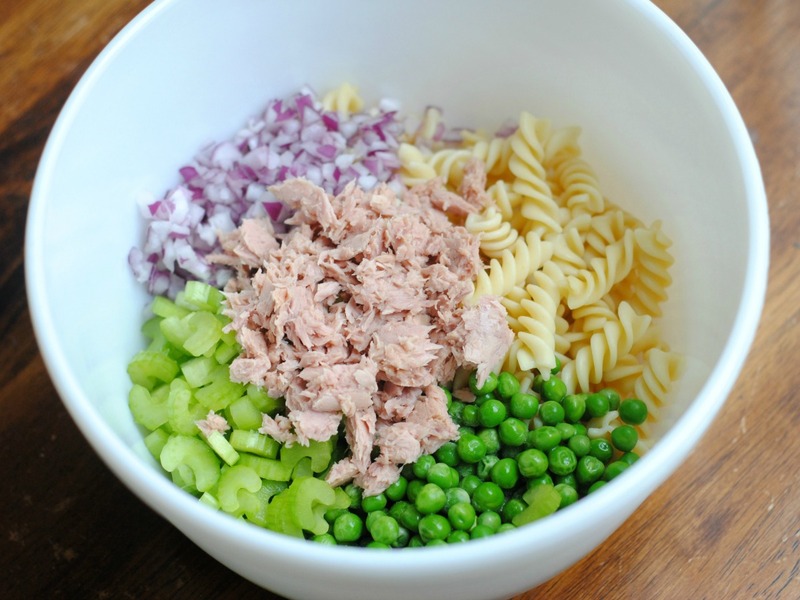 Add the cooked and cooled pasta, peas, tuna, celery and red onion. Gently toss to mix well. Add a giant dollop (really, 1 cup) of mayonnaise and combine well. Then mix in some lemon juice for some extra citrus flavor. It’s a great complement and balances this salad well. A perfect, light and refreshing lunch or dinner for you to enjoy this summer! 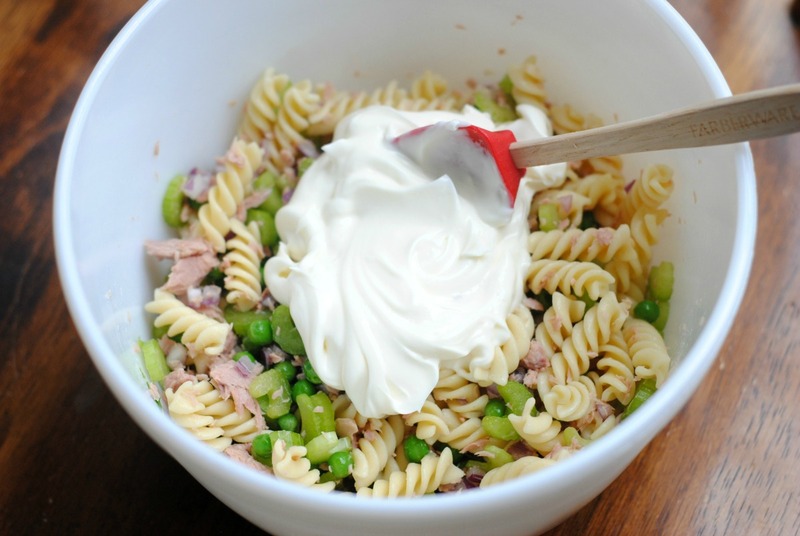 Once the noodles have cooled, place them into a large mixing bowl and add in the tuna, celery, red onion, peas, mayonnaise, lemon juice and salt and pepper to taste. Gently stir to combine all the ingredients, mixing well. Cover and place the salad in the fridge to cool for at least an hour, and to allow the flavors to mix. 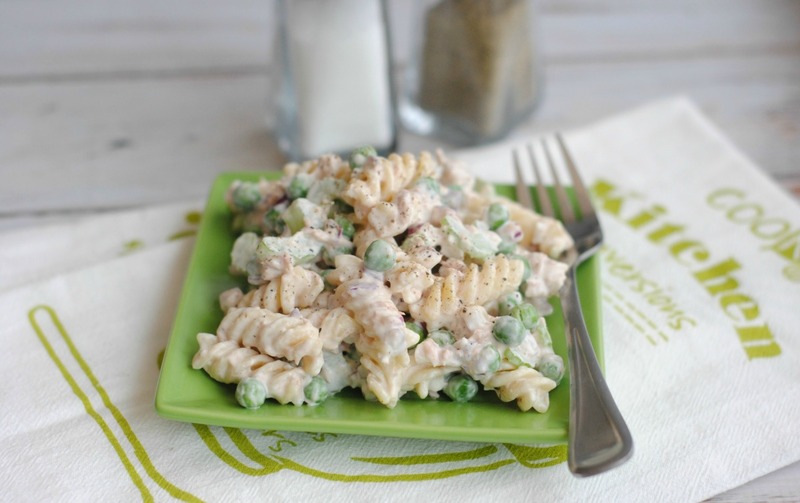 Serve Tuna Pasta Salad as an easy light lunch or dinner, or as a side dish, or take it to summer potluck. Hello! My mom’s version is similar to yours except she used a can of Campbell’s mushroom soup instead of mayo and used egg noodles instead of rotini pasta..Shed bake hers in the oven and we’d enjoy it hot or cold after that. Not a fan of canned peas but this recipe sounds delicious. Can you use frozen peas?